Vinous Reviews of the 2014 Single Block Pinot Noirs Are In! 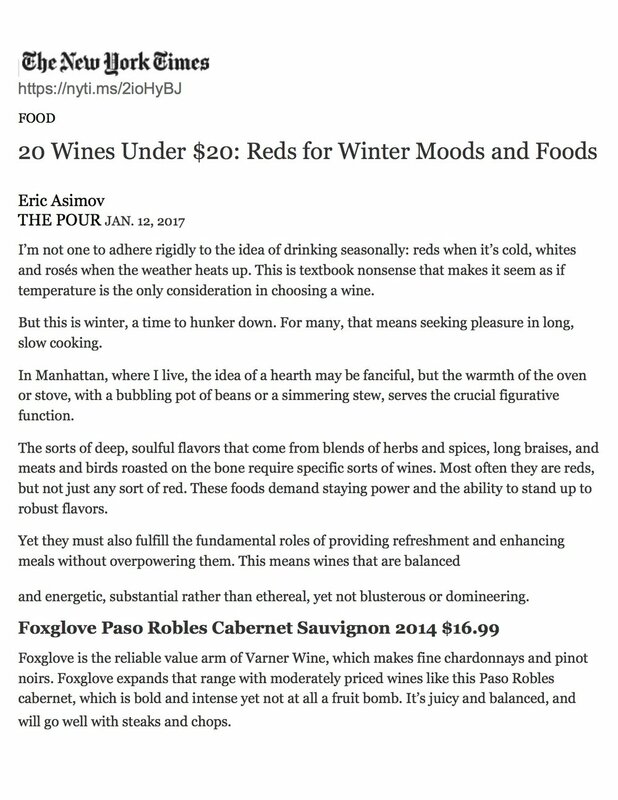 Antonio Galloni reviews the newly released vintage of Cabernet, calling it "impossible to resist on release"
All three Foxglove wines, Zinfandel, Cabernet Sauvignon and now Chardonnay are listed in the NY Times list of the best wines under $20. Taste the delights of the Appalachian Trail when Richard and Anne Arbaugh return to the Beard House for a special springtime celebration. Known for their West Virginia dining gem, this husband-and-wife team will showcase a contemporary take on their region’s culinary traditions. We had our annual tasting with Antonio Galloni and, as always, the conversation was interesting and far-reaching. We especially appreciate how his descriptions encompass everything we are trying to express with the wines. "The 2014 El Camino Vineyard Chardonnay is an elegant and vibrant offering with aromas of lemon zest, freshly sliced apple, white flowers, crushed almonds all taking shape in the glass. This shows wonderful balance and focus with bright acidity leading the way into the precise finish. 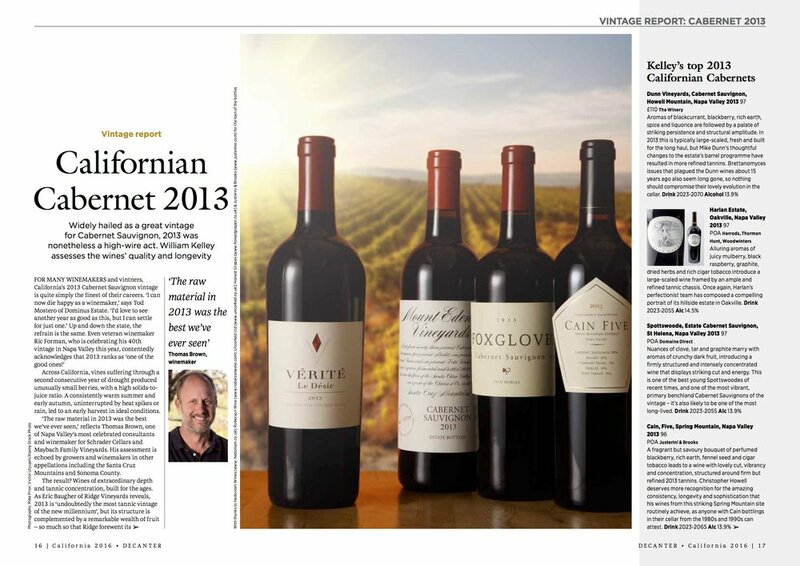 A lovely effort from which should continue to drink well over the next few years." 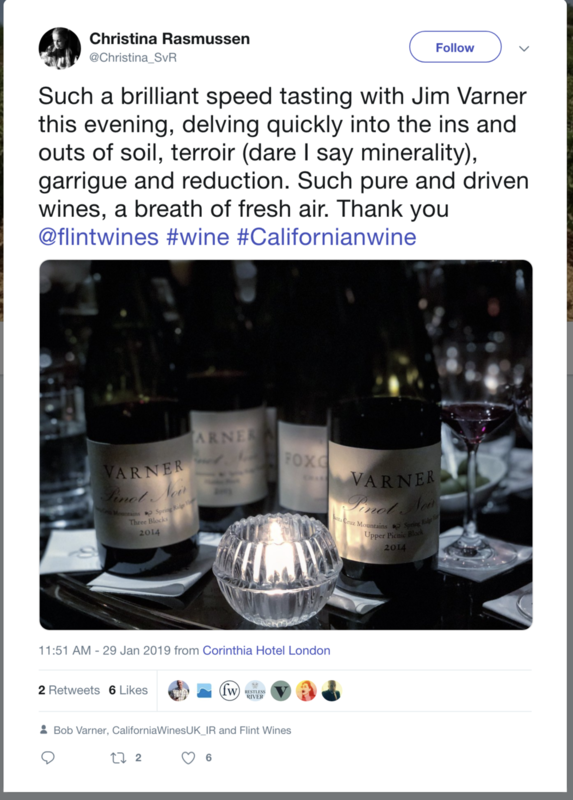 "This Pinot Noir is a lovely showing from Varner, the 33% clone 777 and 67% Pommard clone was sourced from two blocks of the Los Alamos vineyard and is where the vines are planted on gentle slopes in shallow, low vigor soils. It displays bright aromas of wild forrest berries along with a mix of dried spices and floral along with an earthy edge. On the palate this is beautifully structured and well balanced with a silky texture." Wine Weirdos recently featured 2013 Foxglove Chardonnay in one of their 30 second wine reviews. Many thanks to Mike and Pete. Wall Street Journal Includes Foxglove Chardonnay as "The Best Wedding Wines"
Lettie Teague of The Wall Street Journal recommended Foxglove Chardonnay in her Jun 6, 2016 article, "The Best Wedding Wines- According to Betrothed Sommeliers". Heidi Turzyn from Gotham Bar and Grill and Yannick Benjamin from the University Club in New York sat down with Lettie to taste and recommend wedding wines with "wide appeal and a reasonable price". "The Best Wedding Wines- According to Betrothed Sommeliers"